Let's Find Out...about Borrowing History! Borrowing History (aka Reading History), is a feature in the catalog that will keep a record of all the physical items you have borrowed from us. Borrowing History is not automatically turned on, so you will need to log in to your BiblioCommons account and enable it. Once you enable Borrowing History, the catalog will start recording what you check out from that point forward. If you're ready to enable Borrowing History, log in to your account, then select "My Settings" from the drop down menu in the upper right hand corner. In the left menu, you will see the option "Borrowing History." Click on that and you will see the option to enable your Borrowing History. Some of you may have enabled this feature in the past in the Classic Catalog. If you have already been collecting your Reading History in the Classic Catalog, BiblioCommons will pull over the data that has already been collected. If you have not been collecting your Reading History in the Classic Catalog, your data will start being collected from the time you enable it in BiblioCommons. 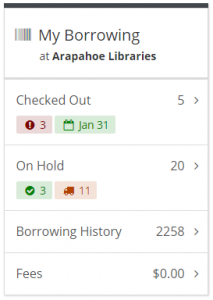 Once you've enabled it, you can view your Borrowing History by visiting My Library Dashboard. Borrowing History enabled, previously turned on in Classic Catalog. Can I sort my Borrowing History? Various sorting options are available until you have 100 titles in your Borrowing History. Because the data is not stored by BiblioCommons and needs to be pulled from somewhere else, sorted on the fly and displayed, it would take a really long time to load if your Borrowing History has a lot of items in it. Adding titles to your Completed shelf provides you with more flexibility. In addition to sorting, you can exclude titles you don't want, filter the shelf, add titles you've read that you didn't borrow from the library, etc., making it easier to find a specific title. Many patrons use both to track their reading! If you disable Borrowing History, it will wipe all of the records stored and there will be no way to recover them. If you turn it back on, it will begin tracking from the date it was re-enabled. Borrowing History does not keep a list of digital items, like eBooks. Only physical items. Borrowing History is not retroactive. It will start collecting your data from the time you enable it. An item will not show up in your Borrowing History until you have returned it. If you would like to export your history or delete individual items from your history, you will need to log in to the Classic Catalog. Look for Reading History and select Export My Reading List or select the items you would like to delete. This is where Bibliocommons pulls your data from, so it will automatically update your Borrowing History in BiblioCommons. Remember, if you Opt Out, it will wipe all of your data. What's your favorite way to track what you've read?